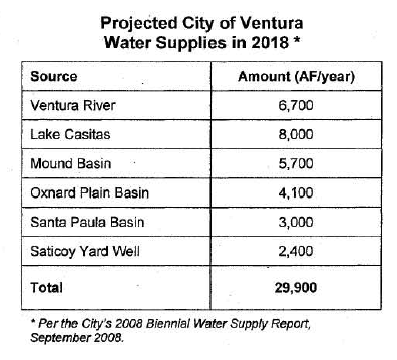 Today, while the 'Sustainability Council' was taking public comment on how to indefinitely continue the current growth rate in Ventura County, the City of Ventura was planning to certify another EIR to facilitate urbanization of some of the last agricultural lands within the city. A very telling letter from County water managers states, "We have reviewed the City's 2008 Biennial Water Supply Study (2008 Supply Report). We believe some of the assumptions may be flawed, and thus its predictions for future water supply may be overestimated." It has come to our attention that the Fox Canyon Groundwater Management Agency (FCGMA) has raised significant issues relating to the Saticoy & Wells Community Plan EIR. The FCGMA letter highlights key factors in the long-term sustainability of the city’s water supply. These issues are not adequately addressed in the EIR. As outlined by FCGMA water managers, cumulative impacts from a drought will (a) overdraft local aquifers causing saltwater intrusion, and (b) dry up the lower Ventura River, critical habitat for the endangered southern steelhead. The city is mistakenly seeking additional water supplies from new wells at Saticoy and Foster Park to provide for increased urban growth. The city is also mistaken in its bid to maintain the status quo at the wastewater treatment plant and delay modernization of outdated urban infrastructure such as storm drains, both of which could provide additional sources of water. Integrated Water Management should be a priority if the city wants to continue growth with these uncertain water supplies. I urge you to ask the right questions, and be aware of the implications of today’s decision. UPDATE: Ventura City Council deferred certification of this EIR until the water issues are worked out. There were many speakers on the issue, including County Council representing the Fox Canyon Groundwater Management Agency and managers of United Water District and others. City council candidate Camille Harris asked the question: "What is the projected population of the city when we run out of water." The answer is that there is no answer, but that the city's projections are good thru 2018 as certified by the 2005 General Plan. Transportation funding for Surfers' Point? New Solution for Dam Removal?